The desired data group tcan be selected here. The name of the data field is shown here. The data type of the data field is shown here. Clicking in this column will open a drop-down list where the control type can be selected. 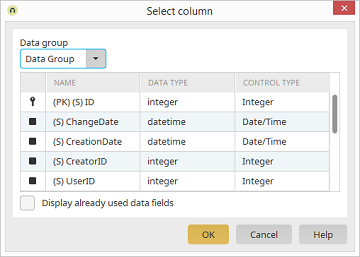 If this setting is not active, you can only choose from the data fields that are not already in one of the table's columns or included as a control. If this setting is activated, all of the selectable fields will be shown.